Wow, in love with the stripes of this jacket! Absolutely gorgeous! The jacket is a great timeless piece! I love the look, so beautiful! what a FAB outfit. lovely! love your coat!!! amazing outfit!! Such a beautiful, nautical themed look! This coat is fabulous - I can't get enough of stripes! Ohhhh love that JCrew chain necklace! Gorgeous jacket, especially loving the fasteners & the chunky chain is the perfect accessory! such a cute jacket! ps... your hair always looks so goooood! love the nautical theme on the coast! a very First Lady outfit! The details on the jacket are amazing. That jacket is gorgeous! You styled it perfectly nautically, with white and gold accents. So beautiful! i literally LOVE ever single piece in this outfit. SO SO cute. You can't go wrong with gold and stripes. Gorgeous jacket! I love a simple outfit that packs a punch! 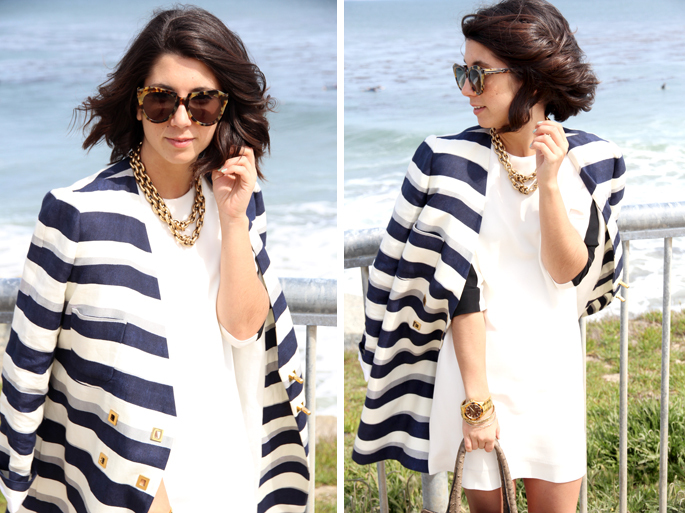 ohhh so nautical, i love that coat! You look so fabulous!! Love the classy coat! Oooh, that Chloe jacket is gorgeous. I wish I had bought those shoes when I had the chance... the bows are so cute. I love the jacket and dress - so modern and clean! Perfect spring outfit. This look is incredibly classic yet modern, love it! So nautical chic! That white dress is perfection, and so is that jacket! WOW!What a gorgeous jacket!Stripes,gold,white,perfect summer look,dear! I Have no words...really love your marine jacket!!! This Chloe jacket is gorgeous! I love this look. The coat is fabulous!! I see this and I just want to go on a boat or a cruise! Or maybe a trip to Nantucket or Martha's...if I go I'll need to borrow that jacket because it is off the charts fabulous! The jacket is quite stunning! It brings to mind a perfect spring weekend. Great outfit, I love the chain necklace! That jacket is just soooo cute! Love the big stripes and the hardware is so different. You look fab... a very classy and sweet outfit! If you ever get tired of that jacket, then I will buy it off you, it is divine and I love it so much!